Are the government programs supporting the financial sector reinflating global stock markets even as economies stumble? 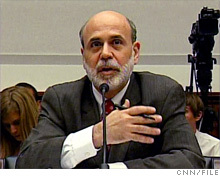 Are Ben Bernanke's efforts to prop up the financial system creating a new bubble? Stocks have surged even as employment continues to fall. With the President's stimulus strategy well into its first year, we asked leading economists to weigh in on his administration's performance. NEW YORK (Fortune) -- The Federal Reserve has spent the past year cleaning up after a housing bubble it helped create. But along the way it may have pumped up another bubble, this time in stocks. To head off the worst downturn since the Great Depression, the central bank has slashed interest rates while funneling money to banks. The Fed has mostly won praise for its efforts. The pace of job losses has slowed, and there has been a modest recovery in output. At the same time, stocks have bounced back with startling speed. Since global markets hit their bottom in March, the S&P 500 has jumped 51% -- even as the outlook for economic recovery remains dim. "This is the most speculative momentum-driven equity market since the early 1930s," Gluskin Sheff economist David Rosenberg wrote in a note to clients Monday. Of course, stocks have rallied in part because investors perceive the worst-case scenario -- a 1930s-style Depression -- is off the table. And while the gains have been remarkable, they come after an even bigger decline. The S&P is still down 16% since Lehman Brothers collapsed in September. Recent weeks have brought huge rallies in some of the lowest-quality stocks -- including firms such as AIG (AIG, Fortune 500), Fannie Mae (FNM, Fortune 500) and Freddie Mac (FRE, Fortune 500) that are being propped up by the government and are unlikely to return to health any time soon. What's more, this year has brought an 80% surge in emerging market stocks, while the dollar has posted a 10% decline since March. A declining dollar and surging emerging markets were the hallmarks of the credit-fueled bull run earlier this decade. "We have put the band back together on a lot of this," said Howard Simons, a strategist at Bianco Research in Chicago. "That couldn't have happened without liquidity." Though liquidity is admittedly a nebulous concept, there's no question that central bankers around the globe have poured huge amounts of money into the markets to ease the financial crisis. Given free money, investors' appetite for risk shoots higher and they gobble up stocks. That's good, except when the outlook for economic growth doesn't seem to support the higher stock values. "Many observers are wondering whether the strong stock market rebound since mid-March is already a forerunner of the next recovery or simply driven by a reflux of liquidity into riskier asset markets," Deutsche Bank Research analyst Sebastian Becker wrote in a report last month. Rosenberg, who notes that consumer credit has dropped an unprecedented five straight months, said it's far from clear the recession is over. He says the risk of a market relapse later this year is high. Simons said another factor that could work against recovery is that short-term interest rates could soon head higher, judging by action in futures markets. That could raise companies' borrowing costs at a time when policymakers have committed to holding rates near zero to restore economic growth. Fed officials have stressed that they will start to unwind their financial support programs at the earliest sign of inflation. Given the cost of cleaning up after the last bubble, Becker writes that "this time, policymakers are unlikely to remain inactive should they suspect the formation of another asset price bubble." But it's clear that bankers are loath to pull back on their support for the financial system before it's clear the economy has staged a stronger recovery. And the Fed has a long and painful history of ignoring asset price inflation. "The central bankers have this textbook belief that the only inflation is the kind that appears in consumer price indexes," said Simons. "They don't believe what they're doing could cause an asset price bubble." For now, Fed chief Ben Bernanke and other central bankers can console themselves for now with stable consumer price inflation readings in major economies. But comparing the bankers with a driver pulled over for speeding for the umpteenth time, Simons said, "At some point, you have to say maybe your speedometer's broken."